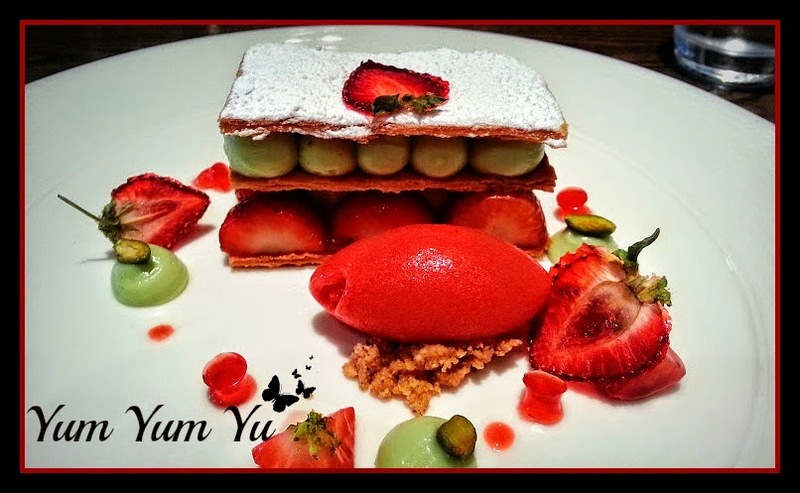 Yum Yum Yu: Pomegranate - A True Delight! The first time I tried Middle Eastern Cuisine was last year in Glasgow; myself and my good friends were feeling hungry and stumbled upon a little gem of a place called "Persia". After that meal, I vowed to eat more Middle Eastern food but never had the chance to, because well, Fife isn't exactly diverse in the world food side of things so it would mean having to travel through to Edinburgh or Glasgow. I came across Pomegranate when I was looking for Middle Eastern restaurants in Edinburgh on-line and after asking fellow food lover, Winses Wee Wok what she thought, I was set to go. We arrived at around 2pm that day and we were the only people in, but that didn't put me off, in fact I prefer it to be quiet so that there is less chance for them to screw up my order. The waiter gave us a choice to sit by the window or to sit in the back room, warning us that window seats can get very hot with the gorgeous sun shining in so needless to say we chose the back room as I 'm not a fan of eating and sweating at the same time. We were sat in the middle of the back room with the side doors open so that we got a lovely breeze coming in throughout the whole meal, which I'm sure they would have closed if we had asked them to but on a day like that, hell no! If you have a huge dislike for a couple of flies coming in and out while you dine then you may want to ask for it closed. The restaurant is bright and clean, not very big so if you were to go on a weekend you might want to book. They have a good selection of non-alcoholic drinks and being a lover of Kopperberg I decided to try out the non-alcoholic version. Yes, it is just fizzy pear juice but it was a damn good fizzy pear juice. The waiter asked us if we had brought in our own alcohol for him to open for us, which was lovely of him to ask and good of the restaurant to not have a corkage fee, but I would never bring my own bottle in to a restaurant as I find that just a little bit rude. Minced lamb mixed with sultanas and encased in crushed rice. The rice had a lovely golden yellow hue to it (most likely from the saffron) and when I cut it open, the aroma of the spices they used was just beautiful. Chicken wings - If you love chicken wings, order this because when you bite in to the crispy, char-grilled wing, you get this awesome chilli and lemon dance going on inside your mouth and it will have you wanting more. I was actually a bit gutted when I saw M reach over for the wings because for the past 7-8 years he had me believing that chicken wings were not good enough for him. He even had the audacity to eat 2 that day, the cheek! The best falafel I have ever had! So fluffy and full of flavour which is a good change to what most falafels tend to be, which is normally dry and pretty tasteless. Cigar shaped filo pastries filled with mozzarella, feta and parsley. I love cheese, not a fan of parsley but this worked. It was the first thing I tried on the table and after that first bite, I knew we were in for a good meal! Nothing to rave about as it is just fried Halloumi, but M ordered it and it accompanied the Tapenade nicely. Pureed Smokey aubergines with tahini, lemon juice, olive oil and garlic. I never liked Aubergines until a few months ago and now I love it. I ordered this to go with my naan and my oh my, it was good! I don't know how to describe it but I could taste every element in it but it all came together very nicely, giving a smooth dip with a slight tang. My least favourite of the dishes. I knew that that would be the case before it came because I have never been a huge lover of tomato dishes anyway but the flavour was intense and M loved it so it's still a good dish. If you have only ever had Naan bread from Indian restaurants then you will be in for a lovely suprise. This is a much lighter bread and more bubbly on the surface. 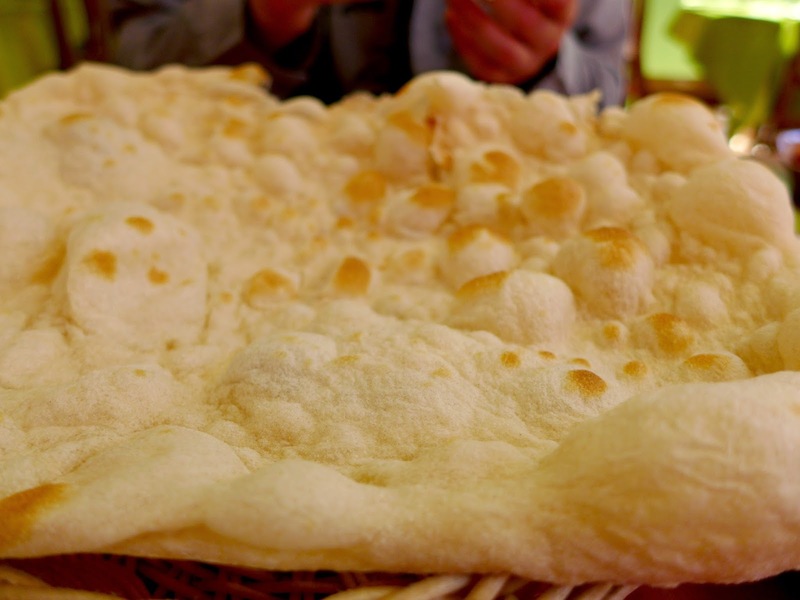 Of all the naans I have had (which is a lot!) this type of naan is my favourite. Look at that crisp bubbly goodness! The 2 waiters were efficient, friendly (but not overly friendly), always smiled at us (not in the creepy way) and seemed to love the food they were serving which is nice to see. When they asked us if we wanted dessert it would have been a shame to say no as the dessert menu looks fantastic. I was so happy to see them have desserts with middle eastern twists as it would have been very anti-climatic to be finishing my meal with just vanilla ice cream! I had the Baklawa and M had the saffron and cardamom ice cream (plus half of my Baklawa). The Baklawa was very crispy on the outside and because it had been rolled after the layering process, this meant that the syrup soaked in to the central layers of filo to create this sweet chewy centre. I'm not sure if the nuts used were pistachios but it still had a good crunchy texture. Would I order it again? No. The dessert was just too sweet for me (although I expected this anyway). M loved the Baklawa and had offered to swap but I could see how much he was enjoying his ice cream so declined his offer. I tried the ice cream and although I could not taste anything (because my mouth was still in sugar overdrive) M said it was very very good. Nothing was too overpowering and the ice cream was very smooth. Win! The waitress was very honest with me when I asked her if the desserts were freshly made on premises, she told me no, but they are made to their specifications and delivered to them. We also rounded off the meal with fresh mint tea and Arabic coffee. Coffee lovers will enjoy the Arabic coffee as it has a slight smokiness but do watch out for the sediment at the bottom of the cup. I made the mistake of not stirring mine before drinking so I ended up with a lot of sediment and it felt like I was downing medicine my Chinese doctor used to give me. Overall, the experience was both exciting and relaxing, thanks to the Pomegranate team. I can't wait to take my food loving friends here for grub the next time we meet in the capital. It is just across the road from the Playhouse so why go to the chains in the Omni centre when you can just nip across the road for some excellently prepared food that is different to most other places in the city? If you have never tried Middle Eastern food, please do as it will open your palate to a whole different world of tasty cuisine. Their food is not only colourful and aromatic but it can be very healthy too. Ask the waiters for recommendations if you are scared to order the wrong thing, I'm sure they wouldn't let you order something you didn't like because at the end of the day they want you to return. I know I definitely will. Thanks for your lovely review, we're glad you enjoyed your visit. Hope to welcome you back again soon, or you could try our sister restaurant Hanam's in Johnston Terrace or Laila's Bistro in Cockburn the next time you're in Edinburgh. Thank you, I will definitely check them out when I next have time.